Agnes Baltsa didn't seem to understand Kundry dramatically or musically. She conceived of the role as a woman devoid of emotion, and her singing has lost strength and character. She was a Kundry with the voice of a former Cherubino. Matti Salminen, the absolute winner of the night on individual terms, unravelled as Gurnemanz a lesson in singing from beginning to end. His phrasing, his intensity were shattering. Plácido Domingo returned to exhibit nobility, elegance and an instinctive melodic feeling, with the freshness of an exceptional middle register. Franz Grundheber shed light on the tragic component of Amfortas, employing a nuanced and dramatic singing line. Agnes Baltsa managed Kundry with more limited resources. Hieratic, distant and sometimes not at all secure in the emission, Baltsa let out nevertheless a few phrases that bear testimony to her class. The second act meant in any case a decrease in the vocal temperature and the unitary climate of the performance, in spite of the orchestral tension being maintained in the pit. Agnes Baltsa, representing the most mysterious creature of the story, Kundry (the witch and slave, temptress and wild child), has at her disposal a severe governess costume: her talent succeeds in avoiding that it distracts us from what she signifies. Her presence, slender and convincing, transmits the transitions that the passionate woman suffers, making it one of the great female parts in operatic history. 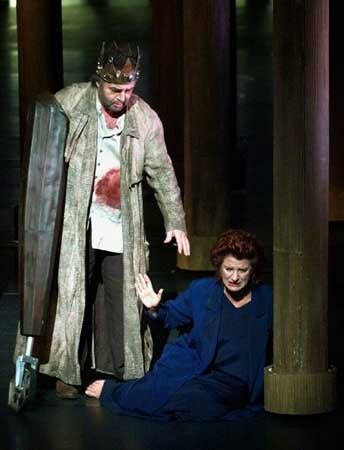 The audience of the Teatro Real welcomed the new production (co-produced with London's Covent Garden) of Wagner's 'Parsifal', which returned with a luxury cast headed by Placido Domingo to the Madrid theatre on Saturday after an absence of 80 years, with 15 minutes of applause. Plácido Domingo and Maestro García Navarro score a hit for the Madrid theatre with Wagner's "Parsifal"
To have a good Gurnemanz means you already have half of 'Parsifal' and at the moment nobody can put Matti Salminen in the shade. The gigantic (in every way) Finnish bass gave an exhaustive lesson in Wagnerian declamation, impressing nobility and sweetness on a character that can otherwise come through as monolithic. To have sung it more than 150 times does not imply routine for him, but a knowledge of the part that reaches into unsuspected recesses. 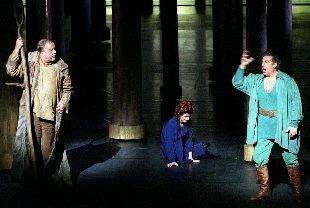 To rely on Plácido Domingo was compulsory in such a crucial work for the theatre. The tenor from Madrid, who has just turned 60, appeared in impressive form, with full high notes and a surprisingly fresh voice. Certainly, in a few phrases one catches a glimpse of Verdi or Puccini, but one has to acknowledge, without reserve, that there has not been, and for many a decade, another Wagnerian tenor with such vocal beauty and expressive generosity, in addition to being able to express a lyricism such as he instilled in the 'Good Friday spell'. We left the auditorium with the feeling that we had witnessed an opera performance on some prestigious international stage. With the difference that this had been achieved at the Teatro Real. Now that this level has been reached, it is necessary and essential to maintain it. The audience of the Teatro Real in Madrid took leave of the opera 'Parsifal' on Saturday night with a noisy ovation which lasted some 15 minutes. The tenor Placido Domingo and the bass Matti Salminen, who shared the stage with the baritone Franz Grundheber and the mezzo-soprano Agnes Baltsa, received the most applause of the evening. The audience also threw flowers to the singers, a thing rarely seen at the Teatro Real with its normally very restrained public. Parsifal, which is shown until March 15, had not been seen in Madrid for the past 80 years. 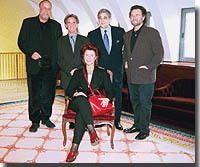 [...] Yesterday during the press conference, singers and musical director alike stressed the 'extraordinary' quality of the music combined with a text that is certainly not without difficulty for the singers, and, in the case of Greek mezzo-soprano Agnes Baltsa, it has been one of the motives that have delayed her debut as Kundry. 'Since very early in my career, I was offered (by Karajan) to sing this part- explained Baltsa-. However, it meant some great responsibility for me because I had not reached the level of maturity it requires', to which she added that if 'she felt great respect for the music' such was not the case for the text, 'that raised many issues as far as I am concerned'. About the reason that made her accept the offer from the Real, Baltsa did not hesitate to refer to the presence of Plácido Domingo as Parsifal. 'Who better to do this part', she declared.